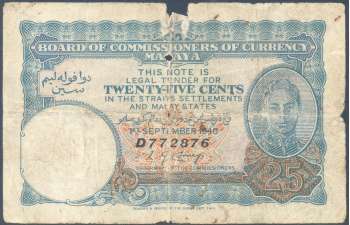 Issued on 1 September 1940 and used until demonetised on 31 August 1948. Because of the outbreak of war in Europe, there was a currency shortage due to silver coins hoarding as the intrinsic value of the metal was greater than the face value of the coins. 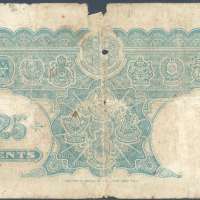 In needs to meet for small change, the Survey Department printed 10 and 25 cents in Kuala Lumpur for circulation. Coats-of-arms of Straits Settlements, Federated Malay States (Perak, Selangor, Negeri Sembilan, Pahang), Unfederated Malay States (Perlis, Kedah, Kelantan, Terengganu, Johor) and Brunei. On the reverse, the sign of aging due to improper storage. It was folded into 8 smaller sections. It is considered rather scarce. Known prefix is from A to F.